Last Summer, I went from inhaling power-ups and being a shape-shifting, cutesy mecha nightmare as Kirby in Planet Robobot to keeping the company of questionable, spirited friends. I’d like to continue the tradition of the latter once the warm clutches of 2017's Summer take hold. Yo-kai Watch 2, here I come. I wasn’t very surprised that I enjoyed the pink puff ball’s last big game. It was fast, furious fun, as Kirby—celebrating his 25th anniversary this year—and his games are wont to be. I was hooked on Robobot and sad when it ended. I wasn’t ready to move on to an involved JRPG which the first Yo-kai Watch threatened to be. The curiosity was there to take on a lauded series, one that spawned not only a successful game series but an animated show too. But what would I find? I was expecting a silly take on the supernatural packaged as joyfully weird affair. And that’s largely what I got. But I also found a game that reminded me of the freakish lore I grew up with in Trinidad and its rich culture. Whereas Robobot gave me a very videogame (but very good!) experience, Yo-kai did much more. Kirby’s frantic driven gameplay became a distant memory as I wrapped my head around Yo-kai Watch’s slower-paced, often ridiculous yet entertaining and sometimes thoughtful trappings. I began associating it with other medium and portrayals of a specific Summer experience—the kind that draws on spooky tales told around a campfire. Yo-kai itself is a representation of that type of storytelling. It’s littered with odd stories of people being affected by otherworldly, mischievous beings. The game played like a light, fun Summer read and it was what I needed. And so this year, I’m putting a lot of stock into its sequel to recreate those simple joys I had in 2016. I’ve heard that it has a terrible repetitiveness in its travel cut scenes. An egregious crime of being unable to skip a tedious train ride. Beyond that negative, I don’t know anything else. And I’ll let you in on a little secret: I intended to save Yo-kai 2 for those dog days but I cheated just a little last week when I found myself with free time with a portable system. So far, the game’s going through the admittedly dull motions of re-introductions to the deceptively large town of Springdale which I called my own last year. But during my short time, I had to make hard life decisions on which type of doughnuts to buy with my measly $10.00. More importantly, it seemed like a cleverly veiled test to pick which parent I liked better—how stressful of you, Yo-kai 2. I also got a fright when a capsule tossing demon trapped me on the school’s roof. The game’s about to open up soon, and I think I’m going to have a fine time with my new Summer tradition of immersing myself in creepy shows or games. I’m already having fun with my friend and companion Whisper, my butler Yokai. His ludicrous humour has been amped up and his rapport with the main character has been just perfect, even if their comedic routine is one I’ve seen before. I’ve met some curious, wickedly fun yokai along with some really bossy and lively NPCs. My Springdale neighbourhood with its bustling, homely and realistic atmosphere is just as adorably quaint as I left it. It feels welcoming to go back this particular videogame home. I just have to hold off a little bit longer to venture into the new areas and the awaiting in-game Summer adventures this sequel offers until our real life Summer actually comes. In the meanwhile, I could finish my two year Final Fantasy Tactics Advance campaign. I could finish Fire Emblem Fates: Conquest. 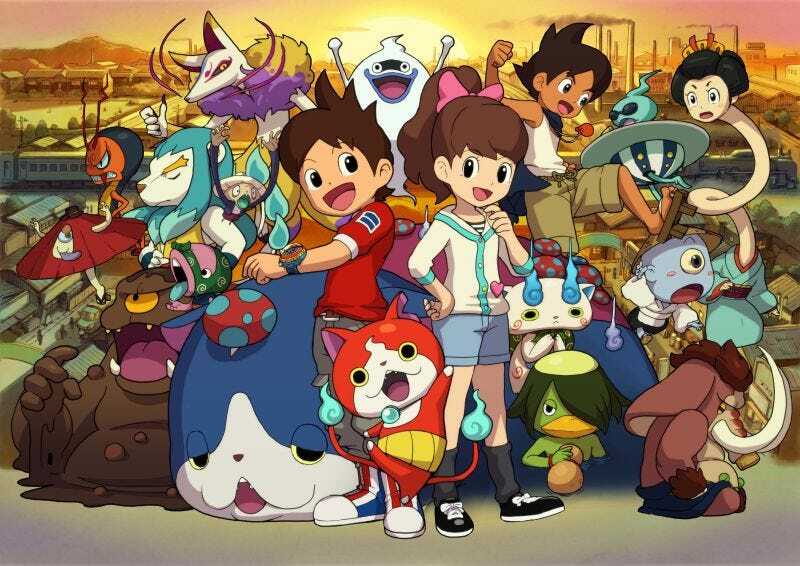 I’ll never have a Summer drought with the backlog I’ve amassed over the years but Yo-kai 2 is the only game I think I want to play (and own) to give me that manufactured association of what a Summer should be. It’s a slightly odd idea I’ve concocted, I know. But Yo-kai Watch’s pleasant—sometimes creepy—strangeness are the kind of “chills” I want on a warm Summer evening as twilight descends. Summer Drought Leads To Summer Reflections.